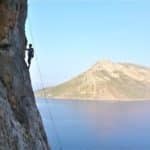 Discover the Greek paradise of Kalymnos with this 6-day rock climbing expedition with IFMGA-certified mountain guide Renato. 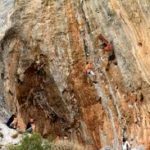 Discover this world-famous rock climbing destination with these 6 days of rock climbing in Kalymnos! This Greek island is renowned as a rock climbing paradise worldwide. You’ll get to find out why! 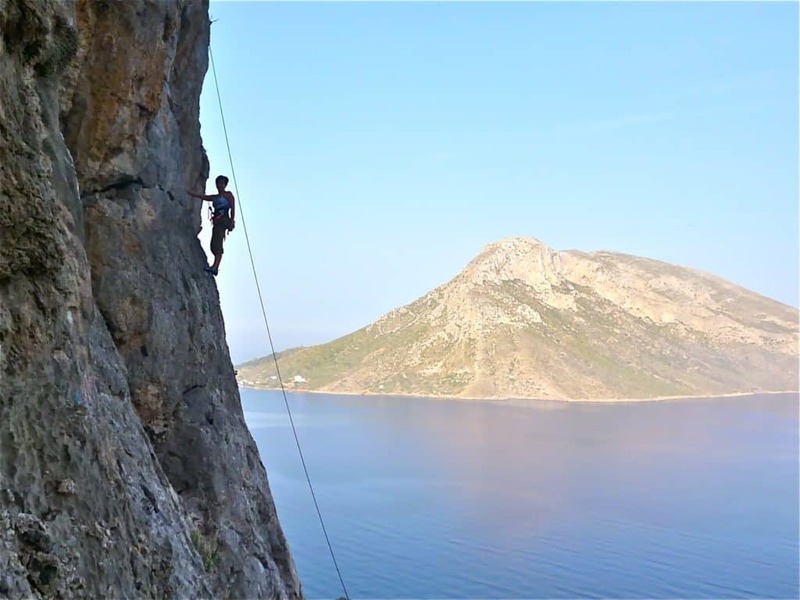 Your technical skills will improve significantly after these 6 days at Kalymnos. 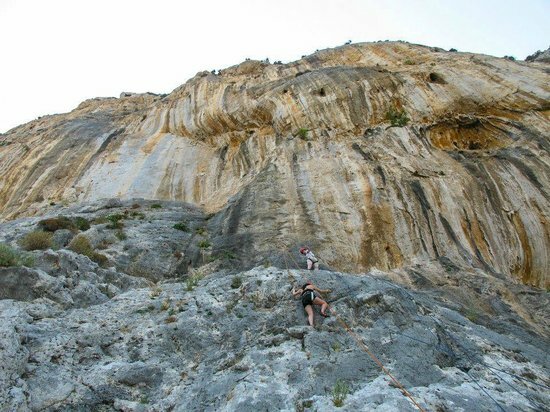 Take your rock climbing skills one step up surrounded by the stunning scenery of this Greek Island. Whether you are a beginner, intermediate or advanced climber, we’ll find the perfect walls for you! I will be your private coach during our time on this Greek paradise. We can take this tour together between April and June and between October and November. With the Mediterranean Sea as a backdrop, these 6 days in Kalymnos Island will stay engraved in your memory forever. The beautiful contrast between the limestone walls and the deep blue sea is a unique sight that every rock climber should get to enjoy at least once. This is a once in a lifetime experience! 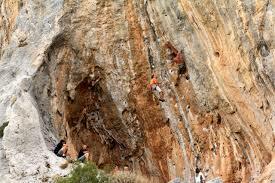 I also offer a 6-day rock climbing tour on the Italian island of Sardinia. Be sure to check is out as well! 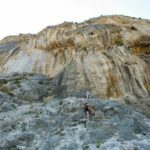 Join me on this incredibly fun week rock climbing the Kalymnos’ walls. Contact me now and we’ll start planning an amazing 6 days of pure adrenaline! I was born in 1961, I live in Campitello di Fassa, in the Dolomites, together with my family. I have two sons, one is a mountain guide, the other is a ski instructor. I am a certified mountain guide since 1982, an instructor of guides, alpine ski instructor and a Federal coach for ISEF. Being in the mountains has always been my passion, guiding people, teaching them climbing, mountaineering... during the various seasons of the year. I very much enjoy drawing nice curves in fresh powder snow and discover the charm of the frozen waterfalls. My curriculum and professional mountaineering is made of many ascents and some openings of routes in the Dolomites and the Alps. I climbed in Yosemite Valley (California), Ben Nevis (Scotland) and Norway, Greece, Spain and Sardinia. I did also several high altitude climbs like Mt Denali (Alaska), Ama Dablam (6828m), Cho Oyu (8201m), Manaslu (8163m), Shivling in India (6545m), Cotopaxi and Chimborazo in Ecuador (5897m and 6310m), Patagonia (Argentina). 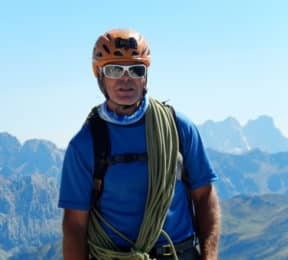 Feel free to get in touch with me if you are coming in the Dolomites for skiing (alpine, freeride and ski touring), rock climbing, sport climbing and multi pitch climbing. It will be my pleasure to guide you here and let you discover my secret spots. haute route. 5 nights and 6 days. Renato became not just our guide but our friend during the trip. We faced unexpected challenges from Mother Nature and Renato protected us. He patiently taught me how to ski tour and maneuver the mountain even though I should have known already. His stories and charming personality made the trip so much more enjoyable. His knowledge of the terrain and our skill limitations allowed him to guide us safely to our destination. We hope to hire him in the future for more fun adventures. We highly recommend him for your guiding needs. stuck in some very bad weather one day and he did an amazing job of leading our group out of a bad situation. The Silvretta traverse was a great trip – beautiful mountains and very nice huts to spend the nights. I would definitely recommend both Renato and this tour! the snow was superb and all the while Renato led us with a mixture humour, patient consideration and under-stated authority. He taught us the key skills of ski touring, including vital avalanche training and other mountaineering craft. Renato was excellent company throughout and I could not recommend him more highly. A true gent of the mountains. adapted well to the different skill/fitness levels of those in our group. He even took pictures of us throughout the trip. We later found out it was his birthday! What a great way to celebrate a birthday by sharing in what he loves to do. Would highly recommend for beginners. Rock Climbing - 5 days - Interm.